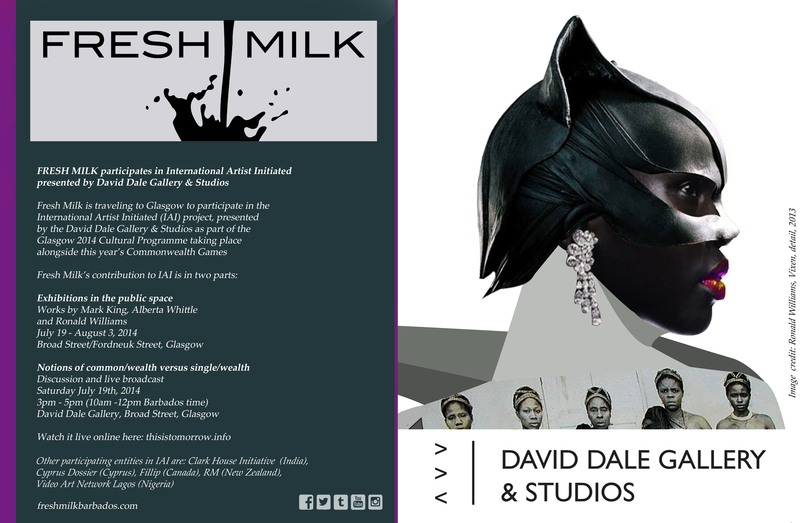 Fresh Milk is very excited to be traveling to Glasgow to participate in the International Artist Initiated (IAI) project, presented by the David Dale Gallery & Studios as part of The Glasgow 2014 Cultural Programme taking place alongside this year’s Commonwealth Games. Developed over the past year, the project is intended to act as a catalyst for discussion and collaboration between artist initiated projects internationally. The structure of the project is designed to be malleable and open source, in that it can be taken and applied elsewhere with different organisations – not that there is anything particularly ground breaking about the idea, but sometimes simple ideas are the most effective – let’s gather a diverse collection of people with similar interests and see what we can create. 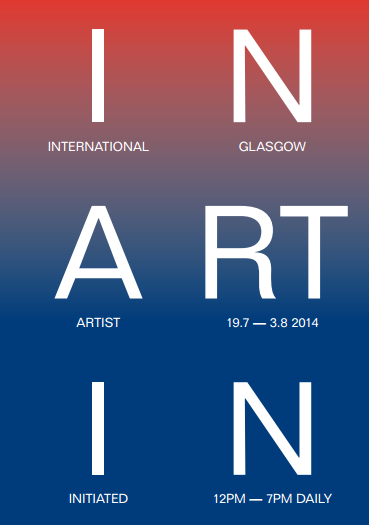 Download the IAI Programme as a PDF here. Fresh Milk’s contribution to IAI is in two parts. The first will see the installation of works by three emerging artists on a billboard, on railings and on the surface of the sidewalk. The artists include a recent graduate from the Barbados Community College, Ronald Williams, who’s crisp digital montages critique the stereotype of the black athlete and will be installed on an extended billboard while Mark King’s temporal, geometric, site specific work will be installed on a pavement. Alberta Whittle’s fête (party) posters show the artist masquerading as both man and woman in her critique of gender stereotypes through her engagement with the local fête posters often seen posted throughout Bridgetown, Barbados’ capital city. The posters will be reproduced in multiplies and plastered throughout the streets of Glasgow. 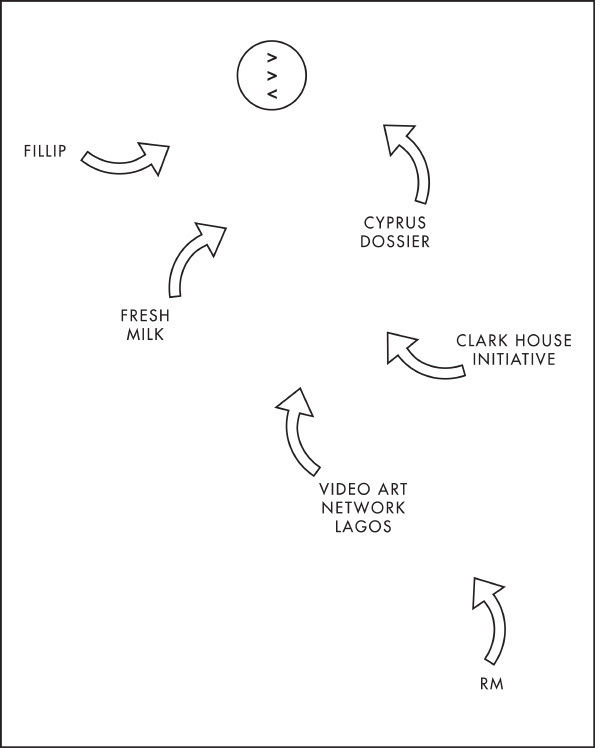 Fresh Milk’s second contribution will be a discursive project called “Notions of common/wealth versus single/wealth”. This dialogical component will provide a platform for representatives of the seven specially invited networks to participate in conversations with each other and the Glaswegian audience. The aim of the conversations will, in part, be to unpack ideas related to the Commonwealth of Nations – the association under which countries gather every four years to celebrate sport in Glasgow in the summer of 2014. The intention is to explore the context of the IAI, as a gathering of Commonwealth Nations, and delve into how that relates to the work we all do as artist led initiatives. The concern is to unpack the Commonwealth as a macro, historical entity and understand our relationship to it, if any, and all that entails. Interrelated are ideas about the definition of wealth and value, both single and common, in our local contexts. Mark King is a multidisciplinary Barbadian visual artist who explores archetypes and social norms. Interested in notions of topography and megalography, Mark makes coded, often satirical work that highlights social phenomena. The son of a former diplomat, Mark has called several places home. Growing up in The Bahamas, Barbados, Belgium, and the United States has left Mark with a unique perspective that directly influences his artistic practice. Mark holds a Masters of Fine Arts degree in Photography from the Academy of Art University in San Francisco, California. In 2011 the Lucie Foundation handpicked Mark for their apprenticeship program. During the same year he participated in a screen-printing residency at the Frans Masereel Centrum in Kasterlee, Belgium. In 2012 he took part in an artist residency at Alice Yard in Port of Spain, Trinidad. In 2013, he participated in two residencies – Fresh Milk in Saint George, Barbados, and Ateliers ’89 in Aruba for the Mondriaan Foundation’s Caribbean Linked ll. Last year he released his first monograph, ‘Plastic’ through MOSSLESS publishing at The Newsstand in New York. Plastic has gone on to The 2013 New York Art Book Fair at MoMA PS1, The 8Ball Zine Fair, the 2013 I Never Read Art Book Fair in Basel, Switzerland, and The 2014 LA Art Book Fair in the Geffen Contemporary at MOCA. My contribution to the Glasgow 2014 Culture Programme is a site-specific work made possible by the access provided by technology. Through virtual and interactive maps I embarked upon an exercise in way-finding from a computer thousands of miles away in Barbados. Through mechanisms such as Google Maps I selected forms present in the architecture and manipulated them to create artworks that draw upon the location where my work will be presented. I have chosen chalk as my medium due to its ephemeral qualities. The resulting artwork is temporary much like the Commonwealth Games in Glasgow. My hope is that spectators from across the globe will come into direct contact with the piece with chalk from the artwork sticking to their shoes and hitching a ride to the neighboring sports venues. The combination of the elements and foot traffic will slowly eat away at the pigment and ultimately return the site to a state prior to my temporary intervention. It is unknown whether the work will last for an hour, a day or the duration of the Commonwealth Games. Alberta Whittle is a Barbadian artist, currently based between South Africa, Glasgow and Barbados. She has undertaken residencies at CESTA (Czech Republic), Market Gallery (Scotland), Collective Gallery (Scotland), Fresh Milk (Barbados), Greatmore Studio and The Bag Factory in South Africa. She choreographs interactive installations, interventions and performances as site-specific artworks in public and private spaces, including at the Royal Scottish Academy (Scotland) and has exhibited in various solo and group shows in Europe, the Caribbean and South Africa, including at the CAS Gallery, University of Cape Town in March 2013 and in ‘WHERE WE’RE AT! Curated by Christine Eyene in Brussels in June 2014. Her practice is concerned with the construction of stereotypes of race, nationality and gender, considering the motivation behind the perpetuation and the different forms in which they are manifested. “Violence is man re-creating himself”. I am interested in the conflict between historical images of the Other and the African Diaspora’s notions of the Self. The spectacle of racial differences relies on a language of bleak oppositions to confirm stereotypes. In Black Skin / White Masks, Frantz Fanon, observed that in colonial discourse “native” peoples are not positioned within the psychoanalytic structure of the Self and Other, but are relegated to the universe of objects, where they remain beyond the limits of cultural intelligibility.Focusing on the concept of subjective portraiture, both as art historical genre and public identity, my research has prompted me to interrogate the potential of Barbadian fete posters as a means of regaining subjectivity. Whilst undertaking a residency at Fresh Milk in 2012, I began a series of digital collages, exploring the production and distribution of fete posters in Barbados. Fete posters are a platform for social commentary, highlighting the acute disparity between gender roles in Barbados, where these representations appear frozen. The posters advertising these “fetes” set the tone and introduce the hosts / hostesses. Each poster must present a selection of portraits of the hosts / hostesses, who enact a series of set poses, often sexually provocative or stereotypically hypermasculine. There are exceptions to this trope, where we are presented with more family-oriented fetes or fetes, which present a more Afro-centric or Rastafarian ideology. However, despite attempts to present themselves as rigidly heterosexual, there are elements of homoeroticism, identified through pose, adornment and dress. Designed to reflect certain ideals, these posters have evolved to reflect a specific format, which typically utilises certain poses, typography, set design and phrases, presenting a fantastical landscape punctuated with exotic animals, signifiers of wealth, including mansions, enormous bundles of cash money, expensive liquor, cars and motorbikes. They are papered on walls throughout the urban and pastoral landscape and also use Facebook as a stage. Drawing from Dancehall and Hip Hop culture, they have become sites to define identity and project capitalist ideals. Assuming a number of different roles, adorning myself in gendered forms of surface design I masquerade as both male and female. Through adopting specific gestures and poses, I attempt to ape the hypersexualised presentations of gender, which are rife in Dancehall culture. These posters provide an opportunity for individuals to present a portrait of themselves for the public to interpret, dismember and enjoy. The creation of this form of portrait photography can be considered a form of documentary realism, which offers a conflicting viewpoint from the stereotypical portrayals of the Other. “Fetes” are parties held at a variety of locations in Barbados, from private homes, bars, nightclubs, to parks and beaches. They are rarely ticketed, usually inexpensive and often free. They can be hosted by anyone, who can secure the venue, organise the DJs, and provide a bar to ensure the party is “HYPE”. “HYPE”, is a colloquial phrase, meaning cool, fun or popular. Born in Bridgetown, Barbados in 1990, multimedia artist Ronald Williams developed an interest in art from a very young age. His art education at the Barbados Community College’s Fine Arts program forced him to view art as a powerful cog in society. Currently, Ronald’s work focuses on race and sociology. He volunteers at the Fresh Milk Art Platform Inc. as part of the editorial team of the Fresh Milk Books initiative. My collages investigate the role that sports and the black athlete play in society. I manipulate popular based imagery to compose computer-generated images that explore sports, perceptions, stereotypes and fantasies about the black athlete or figure, conceptually becoming deliberately self-contradictory as the stereotype is simultaneously celebrated and criticized. The work is designed as a large-scale poster to be installed on a billboard as an adhesive decal similar to how the image of the modern sportsman is represented. 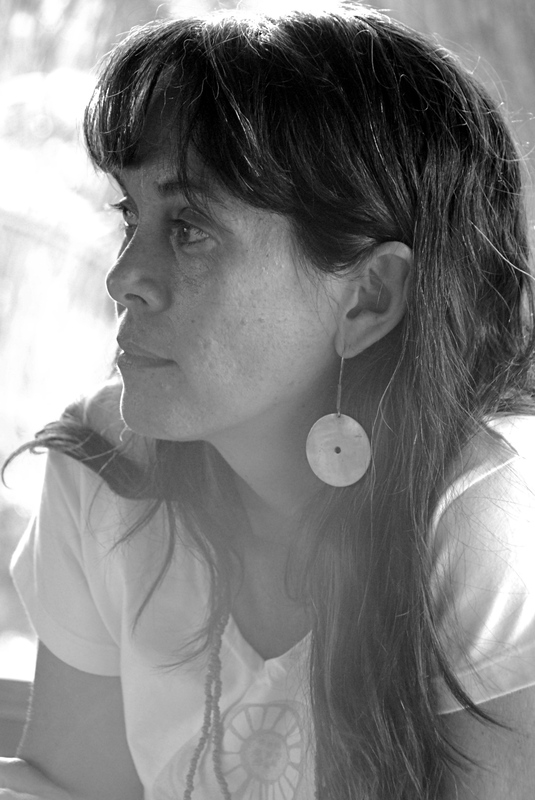 Annalee Davis is a Visual Artist and creative activist living and working in Barbados. Since 2011, Annalee has been the founding director of the artist-led initiative – The Fresh Milk Art Platform Inc. An experiment, a cultural lab and an act of resistance, Fresh Milk supports excellence among emerging contemporary creatives locally, throughout the Caribbean, its diaspora and internationally. Located on a working dairy farm and a former sugar cane plantation, Fresh Milk is a nurturing entity; transforming a once exclusive space to become a freely accessible platform with programming supportive of new modes of thinking and engaging. Annalee is a part-time tutor in the BFA programme at the Barbados Community College. For more on her practice, visit her website and view the Fresh Milk site here. 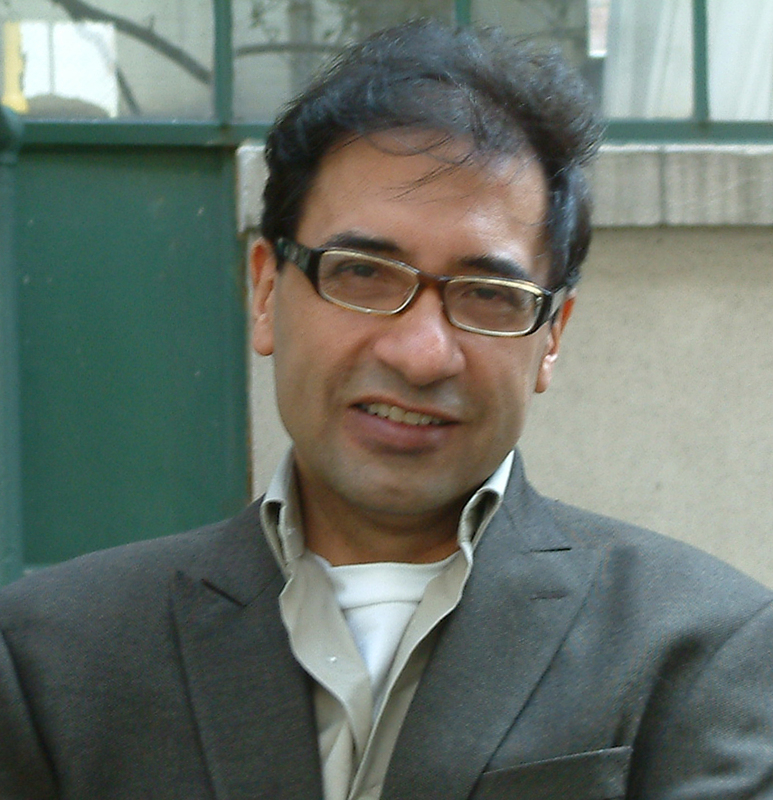 Mario A. Caro is a researcher, curator, and critic of contemporary art, having published widely on the history, theory, and criticism of contemporary Indigenous arts. He is currently an assistant professor in the John W. Draper Interdisciplinary Graduate Program at New York University. His work within the academy complements his endeavors to further global cultural exchange. He is on the board of various organizations focused on art residencies and is the current president of Res Artis, an international network of residencies focused on promoting the worldwide mobility of artists. Mario is the moderator for Fresh Milk’s discursive component as part of the IAI.